In recent years – and in a rather odd turn of its own – the Pilot stood out for its blocky, “truck-like” styling amongst a sea of increasingly swoopy rivals. Pilot also stood out for its ability to seat eight passengers when most in the class could only accommodate seven. Pilot continues to offer 8-passenger seating, something that has long set it apart from the 7-seaters that dominate the midsize SUV segment. But for its 2016 redesign, Honda chose to “go with the flow” and give the Pilot svelte new lines (or as svelte as you can make a box sitting atop a bigger box) while retaining its 8-passenger capacity. Honda says the styling shift is based on feedback from customer surveys – the same surveys that several years ago influenced the previous boxy design that arrived for 2009. Seems the current perception is that the blocky shape made the Pilot a gas guzzler, when in fact, it was at or near the top of its class in fuel economy most years. Which goes to show that the buying public is a fickle (and often misguided) mistress. Oddly, old and new don’t look that different in outlined profile; the front is still blocky with a squared-off tail, the visual “swoop” coming more from body creases and the vehicle’s rising shoulder line. Aiding this effect is a 3.5-inch increase in length, which in combination with a nearly 2-inch-longer wheelbase, also results in more interior room. But in addition to revising the styling, Honda took this opportunity to upgrade the powertrains and add several new features, some necessary to keep pace with recent high-tech safety innovations. Numerous padded surfaces and available two-tone color schemes give the interior an upscale appearance. Ample cabin storage is highlighted by a huge covered console bin capable of holding a woman’s purse. The newly added Elite (shown) tops the Pilot’s trim-level ladder. It and the penultimate Touring come with a new 9-speed automatic transmission featuring an electronic pushbutton console shifter. Although still powered by a 3.5-liter V6, the engine is now rated at 280 horsepower rather than 250. Furthermore, the previous 5-speed automatic transmission is replaced by a 6-speed on most models, while the top two trim levels get a 9-speed. In combination with a weight reduction of nearly 300 pounds, these updates result in better fuel economy (up by 1-2 mpg) and increased performance. Pilots with the 6-speed automatic are EPA rated at 19 city/27 highway in front-drive form, 18/26 with AWD; with the 9-speed, they’re 20/27 with front drive, 19/26 with AWD. But the real benefit comes in acceleration. Whereas Honda pegged the previous Pilot at about 9.3 seconds 0-60 mph, it claims the new ones run the sprint in 7.4 seconds with the 6-speed automatic, 7 flat with the 9-speed. An audio system that automatically buffers your favorite satellite radio stations for 30 minutes as soon as the ignition is turned on. That way, if you change stations and catch the middle of a song, you can go back to the beginning of it, or even go back as much as a half-hour in a sports broadcast. 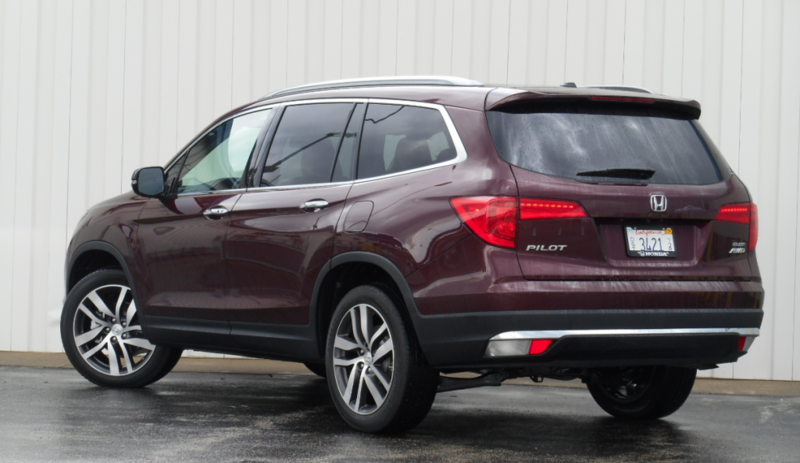 Some of the above features are only offered on high-end models, and as has long been Honda practice, there are no options on any of the Pilot’s trim levels. However, some trim levels essentially have sub levels, which add a related group of features that would normally come in an option package. 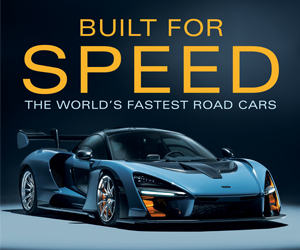 As a result, there are a total of 17 different models; eight with front-wheel-drive, nine with all-wheel drive. Most models use traditional Honda trim-level names. In both front- and all-wheel-drive versions, the sequence is base LX, mainstream EX, EX-L (with leather upholstery), and Touring. Slotting in as the new top-line trim level is the Elite, which is only offered in all-wheel-drive form. The well-equipped front-drive LX starts at $30,875 (including the $880 destination charge), with the AWD version going for $32,675. Neither offers any of the aforementioned sub-models. Among its standard features is a multi-angle rearview camera that includes normal, wide-angle (180-degree), and top-down views. 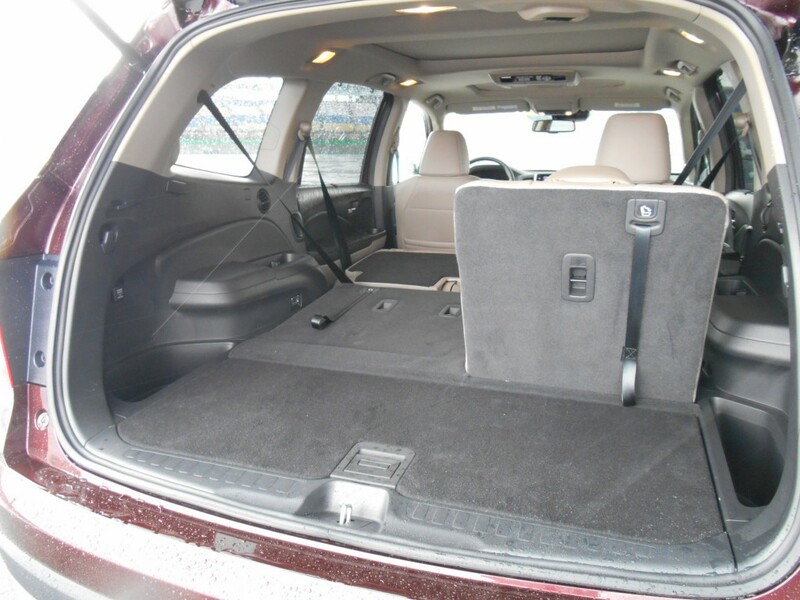 Pilot’s 2nd- and 3rd-row seat backs fold flat and level with the cargo floor for terrific cargo-carrying capability. There are also side bins and a huge “hidden” bin under the cargo floor. EX adds such features as Honda’s Lane Watch right-side camera, tri-zone automatic climate control, satellite radio, and remote engine start. It also adds the ability to get Honda Sensing. EX-L is expected to be the most popular model. Not only does it get leather upholstery, but it also brings heated front seats, a power tailgate, power moonroof, and power-sliding 2nd-row seats. 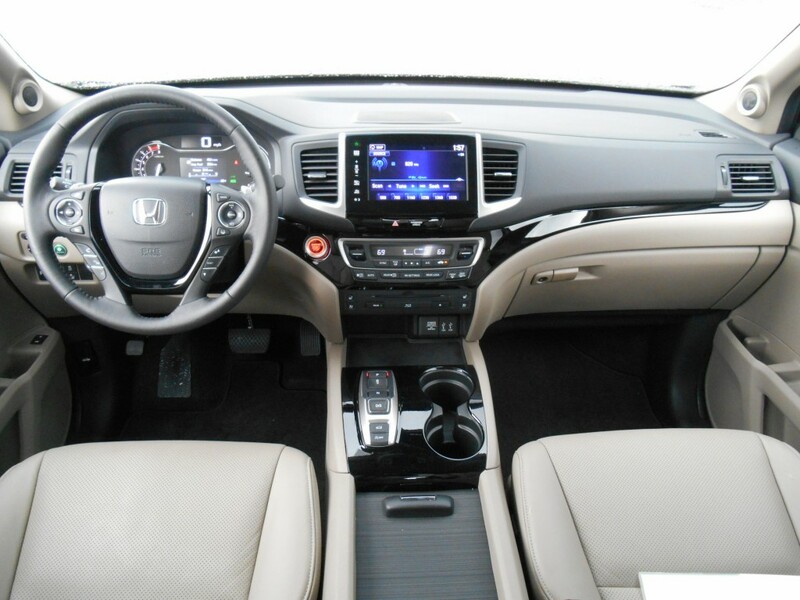 It also offers the ability to get Honda Sensing, Rear Entertainment System, and Navigation system. Touring gets all of the three “sub-model” features as standard, and adds 20-inch alloy wheels (in place of 18s), rear-obstacle detection, memory front seats, and a 115-volt AC (household current) outlet. Elite only comes one way: loaded. Besides the aforementioned all-wheel drive and all features listed above, it adds blind-spot alert (while dropping the Lane Watch right-side camera), cross-traffic alert, ventilated front seats, heated 2nd-row captain’s chairs (which are two buckets rather than a 3-passenger bench for 7-passenger capacity), heated steering wheel, and a panoramic glass roof with individual front and rear sliding sun shades. Our preview drive route took us through the scenic rolling hills of northern Kentucky. Twists and turns were the order of the day, and the Pilot handling them with a confident if not quite sporty demeanor. 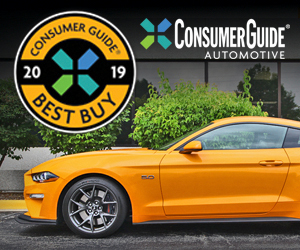 The suspension is a bit firmer than in some rivals, so the ride is more “controlled compliance” than “cushy,” with the 20-inch low-profile tires on the Touring and Elite making minor road irregularities more noticeable. Nail the throttle from a stop, and the Pilot jumps off the line. Power is ample, with the only glitch coming when the throttle is stabbed at speed. Downshifts are often long in coming with the 9-speed automatic found in Touring and Elite models, somewhat better with the 6-speed fitted to the others. (The V6/9-speed combo is similar to that found in the Acura TLX midsize sedan, which suffers the same problem.) While the 6-speed comes with a conventional shift lever, the 9-speed gets an electronic shifter with console pushbuttons for gear selection. Not only does it look more “techy,” it clears the view and reach to some of the lower dashboard features. 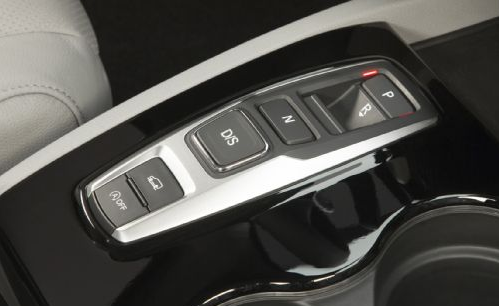 Pilots equipped with the 9-speed automatic transmission make use of this push-button shifter in place of the more traditional shifter found in 6-speed models. Interiors feature numerous padded surfaces (including the door tops) and are available in two-tone color combinations that project an upscale look. At least on the Elite tested, the driver seat was unusually comfortable. As would be expected of a vehicle this size, there’s plenty of adult room in the 1st and 2nd seating rows. More surprising is the amount of room in the 3rd row. The 2nd-row seats slide fore and aft to adjust available 3rd-row legroom, and a low 3rd-row seat cushion allows for plenty of headroom, albeit with a knees-up seating position. A portal that’s 1-inch lower to the ground and 2-inches wider than before allows easy access to the 3rd row, aided on EX-L and higher trim levels by the handy, one-touch, power-sliding 2nd-row seat (which has buttons that can be reached both from outside the vehicle and from the 3rd row). Honda has been moving toward “knobless” audio and climate controls, and that trend continues here. At least on the higher-line models tested, audio settings are controlled entirely through the touch screen or – for some basic functions – through redundant steering-wheel buttons. Some of this we find a bit cumbersome (the sliding volume bar in particular), though it probably gets easier with familiarity. Climate controls are adjusted with repetitive-step buttons or flippers, something we find to be far more tedious to use than rotary dials. Pilot’s primary competitors are the Nissan Pathfinder and Toyota Highlander, both 7-passenger models that have been redesigned within the past two years – and were made available for brief comparison drives. The Pathfinder in particular rode a bit more smoothly but didn’t feel quite as controlled, and the Highlander had the most responsive powertrain, at least in terms of transmission kickdowns. But dynamically, the Pilot holds its own, and offers greater seating capacity and some unique features, all of which makes it a “must see” in a very competitive class. Written by: Rick Cotta on May 20, 2015.on March 22, 2019.